Five-star housebuilder Bovis Homes, is expanding its portfolio and working with Willows Hedgehog Rescue, going the extra mile to help local hedgehogs. Church Meadows, a development of new homes opening in Catshill, Bromsgrove, has extensive landscaped parkland and wetland areas, which has prompted Bovis Homes to trial a new scheme that will benefit hedgehogs and their young hoglets within the area. Bovis Homes' landscape architects have introduced wildlife corridors that will enhance the natural ecology within the site. This includes creating hedgehog access routes through gravel boards in garden fences to allow the prickly residents to roam with ease around their habitat. 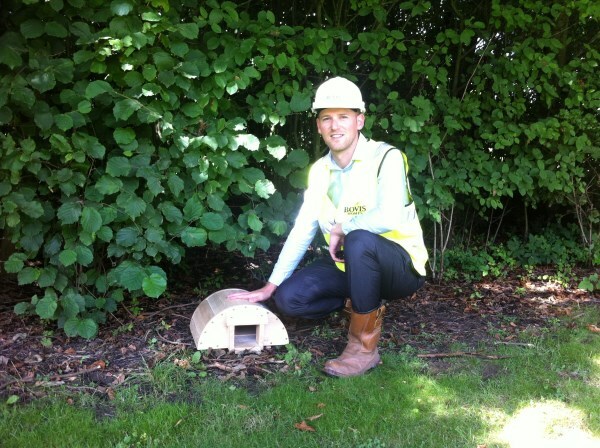 In addition, there will be strategically placed hedgehog houses in the wildlife corridor at Church Meadows. Jayne Lawrence of Willows Hedgehog Rescue said: "It's fantastic that Bovis Homes recognises how important it is to consider the needs of local wildlife in the area. Foraging hedgehogs can travel over a mile each night searching for food and drink but the use of impenetrable fences and barriers can hinder this natural behaviour in a devastating way, forcing hedgehogs to navigate busy roads as an alternative. "The idea of these holes in fencing is really innovative and means that there will be much safer access to food sources for our prickly friends and new residents will be able to enjoy and learn about the nocturnal activities of these interesting animals." David Willars, Regional Landscape Architect at Bovis Homes, said: "Maintaining and enhancing local ecology and sustainability is extremely important to us and we do our utmost to ensure that the needs of even the smallest of local residents are taken care of. This is why the ecological corridor is such a feature of this unique development and will hopefully be something we can include in plans for future sites." And it will not just be hedgehogs benefitting from Bovis Homes' approach to the local ecology with an artificial badger sett already in place and bat and bird boxes being introduced, together with the planting of around 80 trees and hundreds of wildflowers to enhance the existing wetland habitat.